Steve’s breakdown: Ugg is the brand and Deckers is the company. A recent interview with the president will give you all the hints needed to pitch the brand. Read on . . .
GOLETA, CA: A little more than a year since stepping into her role as president of fashion lifestyle at Deckers Brands — a position in which she’s leading the Ugg turnaround — Andrea O’Donnell is striking off items on a carefully crafted to-do list. “It’s well-understood in the industry that today’s consumers are more discerning than ever — they are spending more on experiences and less in retail,” O’Donnell said. After gaining a cultlike following in the early 2000s, Ugg’s softening demand and uneven sales have caused some experts and stakeholders to question its sticking power. “You have a [label] that grew to prominence as an accessible luxury brand, and the problem is that it is becoming less luxurious and more accessible,” said Susquehanna Financial Group LLLP analyst Sam Poser. A color wheel of the new Ugg Classic II.Courtesy of brand. Nevertheless, it may take some time — and significant results — for naysayers to come around. Days after Deckers’ stock took a tumble on its significant third-quarter earnings miss in February, activist hedge fund Marcato Capital Management LP snapped up a 6 percent stake in the firm. The move was widely considered the first big sign, following months of speculation, that Deckers might be on the selling block. The company’s confirmation that it was pursuing strategic alternatives — including a sale or other transaction — came two months later, in April. Marcato has since upped the ante, sending a letter to Deckers’ board in Junecriticizing the strategic-review process and management’s handling of the Ugg brand, which brings in the lion’s share of the firm’s revenue. Despite the turbulent waters, O’Donnell — who has spent decades in retail, most recently as president of global merchandising for DFS Group Ltd., a multibillion-dollar retailer majority owned by LVMH — said she’s forging ahead with a plan, and she expects to reap dividends in due time. Here, she talks about doubling Ugg’s revenues, creating innovative product and retail’s woes. How did you know that joining Ugg was the right move for you? 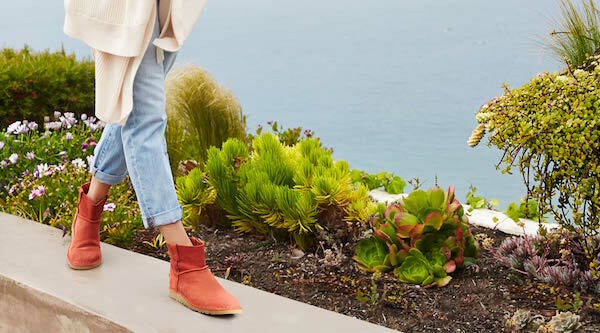 How do you plan to reinvigorate the freshness of Ugg’s product offering? What do you view as the biggest challenges and opportunities for the Ugg brand? How are you approaching industrywide challenges such as consumer shifts to digital and heavy promotions? “We already have a very strong omnichannel business — more than 40 percent of our Ugg business is done through Ugg direct-to-consumer channels, and we have won numerous awards for our customer experience. We’re well-placed to benefit from channel migration. We also continue to believe that consumers will always want to experience the brand, whether that’s through flagship shops or events that allow us to bring the brand to life. We will adjust our investments to reflect these trends.